Frozen has reached an unbelievable level of popularity, as it hurdles towards the $1 billion mark at the worldwide box office. There are a number of reasons why the film has connected so well to swarms of fans, but there is no denying that the music has played a large role in that. “Let It Go” has become a sensation, which is why the news that Idina Menzel would be singing it at the Oscars was met with such celebration. Today, the world’s biggest sing-along to the hit song was held, and you can watch it (and belt it out alongside them) after the break! 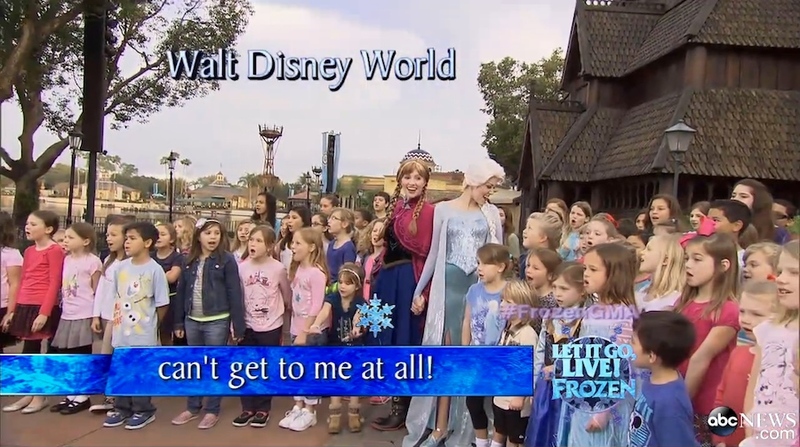 Good Morning America has been asking for viewers to send in their own renditions to “Let It Go” with promises that they would be blended into a massive sing-along held throughout the country. Today, the morning show aired the big event. Menzel herself appeared alongside the cast of “If/Then,” the show she is currently starring in. Additional singers included Lexi Walker, who was the star of the incredible African tribal version of the song, employees of Walt Disney Animation Studios, the cast of “Avenue Q” (humans and muppets), and Anna and Elsa themselves from Walt Disney World. You cannot help but get caught up in the passion displayed by many of the singers. See if you can avoid singing along as you watch the video below! This should officially cement “Let It Go” a phenomenon. It is up for Best Original Song at the Oscars, which airs this Sunday evening on ABC!